Ever since—well, ever since “the beginning”—Satan has been the consummate master of the half-truth, twisting God’s words for his own devices. Go back and read the story of the Fall in Genesis 3, and you’ll see what I mean. Satan says to Eve: “You certainly will not die [if you eat the fruit God has forbidden]! God knows well that when you eat of it your eyes will be opened and you will be like gods, who know good and evil.” This statement can be read as literally “true”: Adam and Eve don’t die immediately upon eating the fruit, and they do, in a sense, obtain greater “knowledge” of good and evil by doing so. But, of course, Satan fails to tell Eve the rest of the story—that, even though they don’t die as soon as they eat the fruit, Adam and Eve will live the remainder of their lives in the light of approaching death, and their new “knowledge” will bring only shame, guilt, and misery. Reading the story with the advantage of knowing how it ends, I confess to wanting to shout at Eve: “Make Satan define what he means when he says you’ll ‘be like gods, who know good and evil.’ You don’t want the kind of ‘knowledge’ he’s offering! !” But, of course, that’s not what happens, and Adam and Eve accept Satan’s offer on his terms and exchange the priceless freedom of innocence before God for the cheap and tawdry knowledge of what it means to be a sinner. Satan hasn’t abandoned this tactic of deceiving God’s children with ear-tickling words and phrases. He continues to use it to this day to keep people away from the Christian faith in general and particularly to keep them away from the fullness of Truth available in the Catholic Church. In this and the next couple of posts, I want to decipher a few of these “code words” he’s using nowadays to trick Christians (both Catholics and non-Catholics, but—at least in my experience—particularly non-Catholics) into settling for an imitation Gospel that, in the end, only leads to misery in this life and makes it more difficult to achieve the Heavenly Kingdom. These code words are: (1) “assurance” or “security”; (2) “dialogue”; (3) “community”; and (4) “freedom.” I’ll address in this post how Satan has contorted “assurance”/“security.” I’ll discuss the others in subsequent posts. Before turning to the specific words, though, it’s important to note first that none of them are bad in and of themselves. Just like the word “knowledge” that Satan used in the Garden is a perfectly fine word, so are all of these when they’re used correctly. Satan, unlike God, is not a creator. He is, in a very literal and fundamental sense, uncreative. As a consequence, he is incapable of coming up with anything on his own. He can only take words that, when properly understood, point toward the Truth, and twist their meaning so that they end up pointing in another direction. God Himself is “the Word”—Satan is merely a deceitful plagiarist. Now, for the first of the code words: “assurance”/“security.” With these words, Satan has had a field day in the modern era, getting people focused on whether they were “assured” of Heaven or possessed “eternal security.” And, of course, on the surface, it sounds great: “You can be sure, no matter what happens between now and when you die, that you’re headed to Heaven. No more worries—you can be set! !” How can that be bad? The truth is, though, that Satan’s “assurance”/“security” pitch is very bad to buy into because it tends almost-inevitably to lead in one of two directions: (1) blithely assuming that, since you’re set, you now no longer have to worry about “sin” and have become an infallible source of doctrinal truth; or (2) endlessly worrying about whether the event that “saved” you in the first place (whatever it might have been) was “real” or not. In other words, this supposedly comforting “assurance” actually leads, in practice, either to presumption or despair. And that’s exactly what Satan wants. What he doesn’t want is for people to take a Catholic approach to the question of their eternal destinies—which is a position of hope, one of the three theological virtues. Hope of Heaven, unlike either presumption or despair about one’s eternity, is founded in acknowledging two fundamental realities I believe many Christians (both Catholic and Protestant) intuitively recognize: (1) what matters in making it to Heaven is not merely the efficacy of some past event but also how I live my life here and now and how I end it; and (2) God’s grace—provided most certainly in the sacraments—is more-than-sufficient to help bring me safely home. By taking this view, I am encouraged to keep on persevering toward the finish line, rather than complacently assuming I’ll make it or nervously frittering away my time wondering whether I got off the blocks just right because that’s all that mattered. See Philippians 3:13-14; 1 Corinthians 9:24-27. Satan’s offer of “assurance” and “security” that we’ll make it to Heaven (before we’ve gotten there) entices us with a certainty God did not intend for us to have and deprives us of the healthy hope we need to see our courses through to their ends. That does not, however, mean that there’s nothing of which God wants us, in faith, to be certain. As I said above, a word (like “assurance” or “security” or “certainty”) isn’t inherently bad simply because Satan twists it to hurt us. But because Satan hates us and hates the thought that we’ll have anything God created us to have, he of course tries to deprive us of that certainty, while selling us his imitation “assurance” and “security” of reaching Heaven. How he attempts to do so will be discussed in my next post. Stay tuned. For current purposes, it is not necessary to get into whether the first sin was committed by persons named “Adam” and “Eve” by the literal eating of forbidden fruit, and the Church doesn’t teach that the Genesis account of the Fall must be read as literal history. Rather, it is sufficient here to posit that there was a first (i.e., “original”) sin by mankind’s common father and mother and that the Genesis account accurately captures the substance of the Satanic temptation they experienced—that, by sinning, they would acquire new god-like knowledge. I recognize this primarily applies to the Reformed branches of Christianity that trace back to Calvin. Those branches, however, have dominated Protestantism in America. In this post, I’m not going to get into the various non-Catholic prescriptions given for how one “gets saved” in the first place. I’ve discussed here how even Protestants recognize this state of affairs can’t be right and have tried to stick band-aids on the problems created by their “faith-alone” soteriology. Faith and love are the other two. Which is why Catholic’s pray for a happy death. I’m not saying that the beginning of the Christian life—baptism—is unimportant. Indeed, I believe it is the sacrament that washes away the stain of original sin. Just because I’ve been baptized, though, doesn’t mean I’m on a one-way, non-stop trip to Heaven. Brothers and sisters: Rejoice in the Lord always. I shall say it again: rejoice! Your kindness should be known to all. The Lord is near. Have no anxiety at all, but in everything, by prayer and petition, with thanksgiving, make your requests known to God. Then the peace of God that supasses all understanding will guard your hearts and minds in Christ Jesus. But as the words were read, I could only think to myself that these words simply reflect the truth: peace for those whose lives have been forever changed by the events of Friday will never be able to be explained–such peace will only come through the grace of God. And I pray that peace will fill their hearts in the days ahead. When I got home and opened up the paper, I found evidence of such inexplicable peace. My new hero is Robbie Parker, whose little girl Emilie was killed on Friday. Unbelievably to me, he was interviewed last night and expressed sympathy for the gunman’s family, saying, “I can’t imagine how hard this experience must be for you.” I’m amazed by Mr. Parker’s ability to express such charity at such a horrific time, and his example is humbling. If a man whose precious little girl was just taken from him can be so loving, what possible excuse can I have not to rejoice on this Gaudete Sunday for the many manifold blessings of God? For the handful of people that read our blog: yes, we’re still breathing. Between the new baby (who is slightly needy), a sort-of potty training 3 year old, homeschooling one of our 3 school aged kids (why do I only homeschool one, you ask? Because I like to make life as difficult as possible for myself), working on high school applications with our 8th grader, and paying attention to the other poor kid I didn’t get around to mentioning, blogging has been at the bottom of my to-do list. And really, it’s been nice to just live for a while and not be constantly dissecting everything I read and hear in order to blog it. I want blogging to be more of an organic thing and less of a “have to keep crafting posts out of every life experience” kind of thing. Probably won’t win me acclaim anytime soon with that kind of approach but that’s fine. So while I’ve had all sorts of post ideas knocking around in the small space of my brain that is left for *thinking* and is not reserved for grocery lists or keeping my house from falling down, I’ve also been pondering the lifecycle of a Catholic convert. There are so many convert blogs out there, and I think each of us is trying, for our own particular audience, to explain why we did what we did. 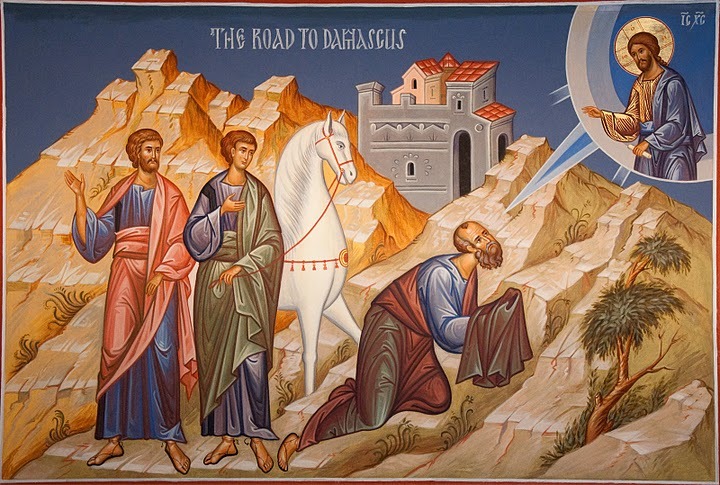 It seems to me that converts feel a great responsibility to those we know on a personal level, and to those we later meet through the blogosphere, to tell them about the amazing journey that has led to the amazing Other, the Catholic Church. But I’ve started wondering if in some ways, the task is somewhat futile, since the Other is so…other… that it’s really hard to explain. Thinking back to some of my older posts, I wonder if my attempts at pointing out the truth of the Catholic Church have been viewed as comparison shopping. As if it was a “Nanny, nanny, boo-boo, mine is better,” sort of proposition. The further out I get from our entrance into the Church, the more it strikes me that it is not that sort of thing at all. Not that I ever thought that it was a matter of preference, or choosing what seemed better, quantitatively speaking, but that I just didn’t do an adequate job of explaining it that way. When it comes down to it, I don’t think a comparison can be made. I suppose one _could_ do a side by side comparison of Catholic vs. Protestant practices, beliefs, theologies, etc. and find a lot of similarities and a lot of differences, but ultimately, I don’t know what the purpose would be. For me, it’s like comparing dragons and paper clips…or puppies and boats…or umbrellas and shoes. You can’t do it. All I feel like I can do at this point, in my own feeble way, is say, “Hey, here’s what I found. Please go look at it, too.” Or at the very least, find out the truth of what it claims before you reject it out of hand. From where I stand now, the past seems so very murky; it’s as if I can’t fully remember or believe where I came from, and now I can’t believe this is not the place I have always been. It’s sort of like a reverse-Narnia. You know at the end of the movie version of The Lion the Witch and the Wardrobe, Narnia, where the Pevensie kids fall out of the wardrobe and they’re all, “Hey, I think I remember this place.” (OK, a very bad synopsis. I’m not a C.S. Lewis nerd, ok? I know, criminal offense.) Well, that’s kind of how it is now; realizing that as a Catholic, I experience a shadow, not a distortion of a shadow of Heaven. As a Protestant Evangelical, if there was one criticism of Catholicism that I heard more than any other, it was that Catholics didn’t have a “personal relationship” with Jesus the way we Evangelicals did. Indeed, this idea of “personal relationship” was at the very heart of my understanding of American Evangelicalism and was what, in my mind, most set Evangelicalism apart from Catholicism, with all of its “impersonal” rituals, hierarchy, etc. The hoopla over the “Why I Hate Religion But Love Jesus” video earlier this year is an exemplar of this. Once I started scratching the surface of the stereotype, though, I discovered that the truth is the exact opposite of what I always believed as an Evangelical, and Catholicism actually emphasizes an individual’s personal relationship with God far more than anything I encountered before becoming Catholic. The reason for this is actually fairly simple. When, as an Evangelical, I talked about having a “personal relationship with Jesus” and how that set me apart from Catholics, I wasn’t really talking about my ability to pray directly to God or do anything else that might increase my chances of one day seeing God face to face. I vaguely knew that Catholics didn’t really object to that notion of “personal relationship.” Rather, what I was talking about was my own personal ability to interpret the Bible and determine, for myself, what was (and wasn’t) true Christian doctrine. It eventually occurred to me, however, that this had nothing to do with whether my relationship with God was “personal” or not. In fact, it actually made it harder for me to have any kind of relationship with God, as I’ll try to explain. I want to love my neighbour [and Jesus] not because he is I, but precisely because he is not I. I want to adore the world, not as one likes a looking-glass, because it is one’s self, but as one loves a woman, because she is entirely different. . . . A man may be said loosely to love himself, but he can hardly fall in love with himself, or, if he does, it must be a monotonous courtship. Only when I gave up the supposed “freedom” to decide what constituted an orthodox understanding of who Jesus was—and recognized that responsibility rested with the Catholic Church—did I begin to realize what I’d been missing out on and to see what “personal relationship” really meant. As a Protestant, I’d been totally caught up in just trying to figure out who Jesus was. Was he the Jesus of the faith healers who promised me health and wealth? Was he the Jesus of the liberation theologians who promised an end to oppressive political regimes? Was he the Jesus of the white, Anglo-Saxon Protestants in this county who oftentimes seemed to believe that the point of Christianity had been to lead to the founding of the United States? Etc. Once I was released from the futility of these questions, I could see that none of them really had anything to do with how I “personally” related to Jesus. So, you may ask, what does “personal relationship” mean within the context of Catholicism? I think the answer is this: God, who is wholly “other” from me, desires for me to live with him forever and, because of that, he gives me his grace to help me develop and deepen my friendship with him so that, when I die, I will hear the words, “Well done, my good and faithful servant. . . . Come share your master’s joy.” And I do that, individually and personally, through: praying, reading Scripture and other devotional literature, participating in the sacramental life of the Church, and striving each and every moment to live my life in accordance with the Church’s teachings. Through each of these, I can come to know—and love—Jesus more and more and experience His love for me more and more. This is particularly true of receiving Our Lord in the sacrament of the Eucharist. What could be more personal than receiving Christ Himself—Body, Blood, Soul, and Divinity—in the consecrated bread and wine of the Mass? 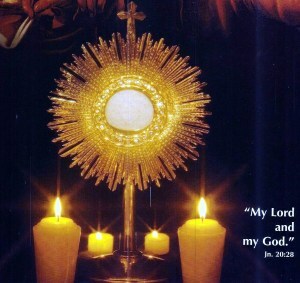 Each time I receive, and the priest or Eucharistic minister holds up the host and says, “The Body of Christ,” I’m blown away by the fact that I am literally beholding Christ with my own eyes and that He has humbled Himself to become His people’s very food. Nothing could possibly be more personal. The same is true of the sacrament of Reconciliation. Once I understood that the priest can only speak the words of absolution because he is acting in persona Christi (in the person of Christ), I saw that going to Confession is an encounter with Christ himself, working through the priest. As with the Eucharist, the Confessional is an extraordinarily personal thing. When done correctly, you are out loud baring your soul–all the worst things about yourself–and then, in response, hearing out loud that you are forgiven. Nothing I experienced in Evangelicalism came close to being as incredibly personal. So, if all of this is the case, what is it that Evangelicals are criticizing when they take Catholics to task for not having a “personal relationship” with Christ? Well, I think it’s actually two things, neither of which has anything to do with the personal-ness of a Catholic’s relationship with Jesus: (1) Evangelicals’ perception that many Catholics don’t take their faith seriously; and (2) their sense that much of Catholic practice is ritualistic and repetitious. On the first of these issues, it would undoubtedly be a good thing if everyone who calls themselves a Catholic knew their faith and practiced it consistently. But that has no bearing at all on whether the Church calls her children to a “personal relationship” with Our Lord. The simple fact of the matter is that she does. And, on the second issue, I can only say that, as a Protestant Evangelical, I was only too quick to judge the hearts and intentions of Catholics participating in the Mass or reciting the Rosary (for example), both of which are admittedly repetitious. But Scripture never says that there’s anything wrong with repetition, in and of itself. It’s only vain repetition (or, in the words of a more modern translation, “babbl[ing]“) that presents a problem. And, as I’ve discussed before, our day-to-day life—including our most significant human relationships—is full of repetition so it’s quite natural for our faith lives to be as well. The bottom line to all of this is simple: on this issue of “personal relationship,” as with all of the others I struggled with in the process of becoming Catholic, my objection was based on a completely wrongheaded notion of what the Catholic Church really taught and utter confusion regarding the meaning of the terms I was using. So when I finally woke up to the fact that what I really wanted was a “relationship” with God, not the ability to define God for myself masquerading as a relationship, the choice was easy, and Christ’s Church was waiting for me with open arms. For EXCELLENT Catholic responses to this likely-well-intentioned-but-nevertheless-hopelessly-confused take on Christianity, see here, here, and here. Indeed, in my more Reformed moments as a Protestant, I would have denied that there was anything that I personally could “do” that was beneficial to my salvation. Rather, it was all up to God. And that makes for a pretty one-sided “relationship,” so what does it matter if it’s particularly “personal” or not? Saying that a person has a “personal relationship” with the Calvinist God is like saying a robot has a “personal relationship” with the engineer who programmed it. And the fact that another human being–the priest–is involved in Confession doesn’t make Confession any less a personal encounter with Christ. If we have a problem with God using matter and human, tangible things to convey grace to us, then we have a problem with Christ Himself–who was fully human in addition to being fully divine. Today marks a very special day for our family: In addition to celebrating the Solemnity of the Assumption of the Blessed Virgin Mary, it’s also the one-year anniversary of our reception into the Church! What an amazing year it has been. 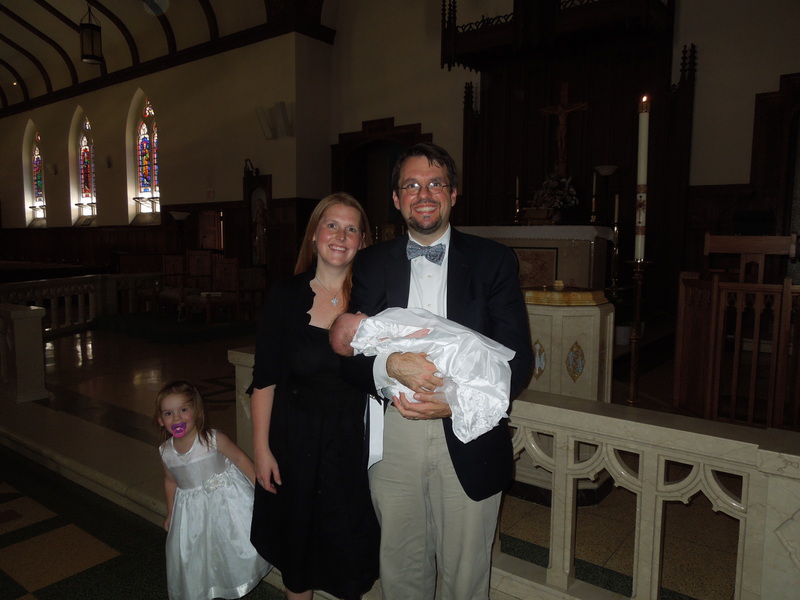 We’ve celebrated the baptism of our 2 year old daughter, the First Holy Communion of our 8 year old daughter, and more recently, we welcomed our newest little one, Isabella Cecilia in June. We were thrilled to seal the deal and have her baptized, making her the first cradle Catholic in our family! When we started this blog, we felt like there were a million different reasons compelling us toward Rome; now that we’re in, we’re amazed that we are constantly discovering even more reasons why the one true Church is the place to be. We’re hoping to be more active in the blogosphere again soon once we get back into our fall routine.